It is always risky to make speculative statements about historical figures, but I’m going to go out on a limb and make one: If St. Paul were alive today, he would have a blog. And whether he called it Paul’s Ponderings or Tarsus Tome, it would light up the computer screen with his provocative insights. Musings about Paul as a blogger came to mind when I read that Pope Benedict XVI is encouraging priests to embrace online communication tools. Publications on the World Wide Web like blogs (regularly updated online journals or forums) can “open up broad new vistas for dialogue, evangelization and catechesis,” according to the pope. Paul, that passionate evangelizer and masterful letter writer, would probably have immediately grasped the potential of a medium that allows access 24/7 from any computer anywhere in the world. 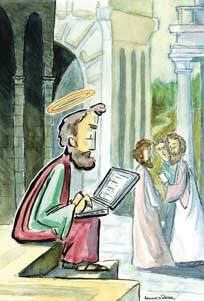 I agree with the pope that these new forms of communication hold great promise for the church. More surprising are the ways in which they can shape the spiritual lives of those who create them. As the parent of a new blog, I speak from experience. I have been a freelance writer for more than 20 years, writing books and articles on a wide variety of subjects. In the past few years I have focused increasingly on spiritual topics and last September launched a blog called The Holy Rover. I gave it a subtitle, “Travel Tips for Inner and Outer Journeys,” figuring that would allow me a wide range of topics to cover. It took me a while to get used to this new writing form and to figure out how to post pictures and videos and how to link to other sites on the Internet. The daily routine was overwhelming at first as I tried to come up with something new each day. I started The Holy Rover, frankly, in large part as a marketing tool for my work. But as I have followed the discipline of blogging six days a week, I’ve discovered that its primary benefits have been to my soul rather than to my career. During Advent last year I began to realize how much blogging was shaping my spiritual life. Each day I was forced to dig a little deeper into the meaning of the season, trying to find a new facet of Advent to write about. I knew that some of my readers were not Christian, and that others were half-hearted Christians at best. I struggled to find ways to interpret doctrines like the Incarnation and even searched for images from great works of art that might convey ideas that I could not express well in words. Occasionally I came across something that made me sit back in my chair, moved to tears. I read a line by the author Anne Lamott, for example, in which she says that perhaps when a lot of seemingly meaningless things start to go wrong all at once, it is to protect something big and lovely that is trying to get itself born and that we need to be distracted so it can be born perfect. Then I found a poem by Wendell Berry, so lovely as to be almost crystalline, a piece that describes discovering the Christ Child in his barn one cold winter morning. I never would have stumbled across such beauty if I hadn’t been searching for material. In months of blogging I have come to relearn an old truth: Many of us know what we think only after we’ve written about it. Just as my experience of Advent was deepened, so my Lenten practice also was richer this year because of the blog. In trying to explain to my readers why fasting is traditionally part of Lent, for example, or why the seven deadly sins convey eternal truths about human nature, I keep discovering new insights into ancient themes. While I have never been a huge fan of St. Paul, I have come to have much more respect for his skills as a writer. A blog like mine is essentially a letter, addressed both to people you know and to others you don’t know. Those who lived alongside the historical Jesus had a chance to experience his mystery in person, but those who came after him, like Paul, had to communicate Jesus’ story in words. That’s a challenge, whether you do it at a computer keyboard or with ink on papyrus. I also have grown (grudgingly) to appreciate the discipline blogging requires. I’ve struggled for years to try to keep a regular prayer life, but knowing that people are reading my blog each day motivates me. It keeps me alert to the movement of the Spirit around me, and it has helped me realize that writing itself can be a form of prayer. Conventional wisdom says that online communication is inherently isolating. It can be, with people connecting by Facebook and Twitter instead of conversing face-to-face. But we shouldn’t quickly dismiss the connective power of online media. I have corresponded with people around the nation and in several other countries simply because they happened upon my blog. I treasure those links because as a writer, I do work that is basically solitary. One drawback of blogging, of course, is that it is time-consuming, particularly for those who already have very busy lives. Even with my flexible schedule, there are times when writing a post feels like one more duty to cross off my list, a lot of effort for little reward. I wonder about the value of blowing literary dandelion seeds into cyberspace. I do, however, know one person whose life has changed for the better as the result of my blog: me. I have become a more thoughtful, disciplined Christian as a result of keeping this online journal. And on a good day, I can feel a kinship with I do, however, know one person whose life has changed for the better as the result of my blog: me. I have become a more thoughtful, disciplined Christian as a result of keeping this online journal. And on a good day, I can feel a kinship with St. Paul, sitting in prison as he pens an epistle to a scattered church, not knowing who will read it or how they might respond, but living in faith that the effort is worthwhile. I've been keeping a blog since 2004. From my first post, it has seemed to me that posting to it has helped me become more accountable, thoughtful, and prayerful as I've made many changes in my life. For instance, I've changed my political affiliation from Republican to Democrat to now Unaffiliated, each change with good reasons, and my blog has helped me clarify my thinking at each step. The blog is valuable resource in living out my Catholic faith, exceeded only by the wonderful priests and others in my local parish (Denver's St. Ignatius of Loyola) and at our Sacred Heart Jesuit Retreat Center in Sedalia, Colorado. Posting my comment here seemed to have resulted in some scrambled words. Sorry. Anyway Lori, please let me quote your WE KNOW WHAT WE KNOW ONLY AFTER WE'VE WRITTEN ABOUT ABOUT IT. Thank you for the article and for this thought that I would like to use in my new book on learning. This writing by blogging and other ways can be used for spiritual awarenss and secular purposes like learning schoolwork or learning anything. This article also appeared in print, under the headline "Seeding Cyberspace," in the May 10, 2010 issue. Lori Erickson, a freelance writer based in Iowa City, Iowa, maintains a blog at holyrover.wordpress.com.